To be honest I had low expectations for this book. The subject of a killer storm is of course intriguing, but Erik Larson's previous books had a more human element, and let's face it, they had crime as the subject, which always makes for an interesting read. 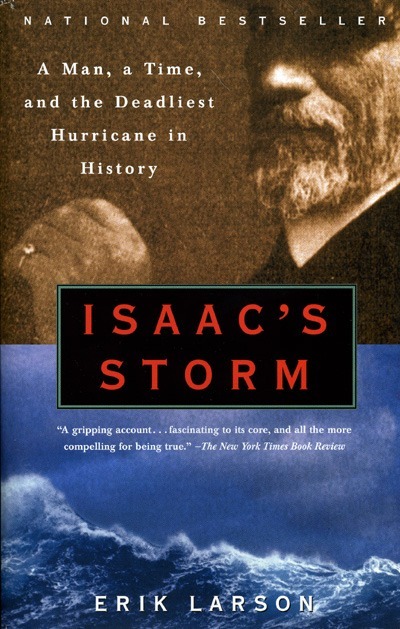 Isaac's Storm, though a different subject than his previous books, actually had a lot in common. One of Erik Larson's talents in his books is bringing the reader back in time. Some people will get lost or bored with the surrounding details that at first glance might seem extraneous, but it is those details that really sell the book, and it's no different here. Larson expertly brings us to turn of the 20th century Galveston, Texas (and other areas of the US and Cuba) where Al Roker and satellite weather imagery don't exist. This is an America that prides itself on science and the machine, and that with those two all things are knowable. Using science and observation the National Weather Service prided itself on being the authority on weather. Using many observation stations it had cataloged the behavior of plenty of storms, so when a storm came through Cuba it was classified as a storm and predicted to head out north-east to the Atlantic. Isaac, the Galveston, TX NWS observation manager, was constantly told that, despite what he was seeing (signs of an approaching storm), the storm wasn’t headed towards Galveston. The book goes into detail about how the NWS was reluctant to label anything a hurricane or cyclone, and it’s petty rivalry with Cuban weather forecasters, who did predict the storm correctly but were shut out by the NWS in making warnings. The story of Isaac’s place in the storm is typical of men during the time. Loyal to a fault to the service, Isaac toed the company line even though his observations didn’t entirely line up with what reports were predicting. On the day the hurricane made land Isaac finally advised the beach areas to be evacuated, but sadly it wasn’t enough. Between six to twelve thousand people lost their lives during that storm, and the description of the water, rain, and flooding Larson writes about is truly frightening, and for a Californian, hard to imagine. Isaac himself lost a child and his wife as he, along with many others, assumed their houses would be strong enough to stand up to the storm. If nothing else this book reminds us that the weather, though understood a little better now, is just as unknown and just as dangerous today.